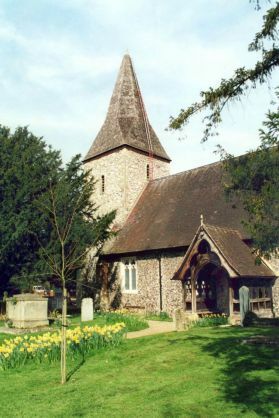 The Parish Church of St Peter and St Andrew was probably built on the site of the chapel attached to King Edward the Confessor’s hunting lodge, and it is possible that it was the king who added his favourite saint, Saint Peter, to an original dedication to St Andrew. Several synods or meetings of bishops took place here in the early days. After King John had been obliged to set his seal to Magna Carta in 1215, mercenary French soldiers came through Old Windsor and destroyed the church, which may have been mainly built of wood. The church was rebuilt in 1218 and had thick walls and small windows. During medieval times some of these windows were replaced with larger ones. In Georgian times, the church had a stone porch, in which weddings were sometimes celebrated, and on the tower was a small cupola. An avenue of larch trees, of which some stumps can still be seen, led to the north door. As wealthy families moved into the village, bringing their servants, there was not enough room in church and a gallery was built at the west end to accommodate the children. However, as they were badly behaved it was necessary to appoint a beadle to keep them in order. The church contained many large memorials. By 1865 restoration was needed and the architect Giles Gilbert Scott carried out an extensive plan, removing the porch, the gallery and the three-decker pulpit, and installing the rood screen, pews and choir vestry which we have today. The spire was built to replace the cupola. Three extra bells were added to the five dating from 1775, to make the ring up to eight bells. Subsequently, restoration campaigns have resulted in the replacement of much of the damaged stonework around the windows and on the tower. The spire has also been re-shingled several times. The church suffered a serious fire on Easter Day 2008 but has now been fully restored. 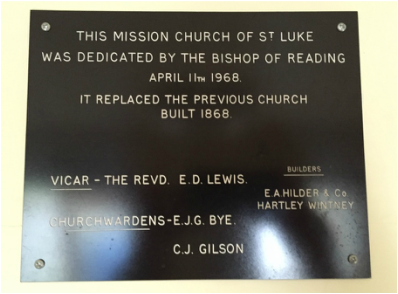 The old St. Luke’s was built in 1867 at the instigation of Lady Blunt the wife of the Vicar of the time. It was a brick building with one side aisle. The chancel area could be separated from the body of the church by drawing a velvet curtain when the church was being used for social activities. In the side aisle stood the big table which is now in the Parish Church vestry, and the village library was kept in two bookcases, and presided over by Mrs. Marston the Churchwarden’s wife and former Infant School headmistress. When it became obvious that it would be better to build a new church rather than attempt to repair the old one the churchwardens looked at possible buildings. The one chosen was similar to the small church at Braywick, and was a prefabricated building. As it is wooden, planning law required a space around it, so the kitchen and committee room were built in brick so that they could go closer to the boundary. Then came the choice of furnishings. By far the most illustrious item in St. Luke’s is not what you would guess – it is the carpet. In 1960, Westminster Abbey sold off all the carpet which had been in the Abbey for the Coronation, some gold and some blue. The PCC bought a piece of blue carpet and put it in the chancel of the old St. Luke’s. For the new building it was cut in half and relaid behind the altar – you can see the seam. 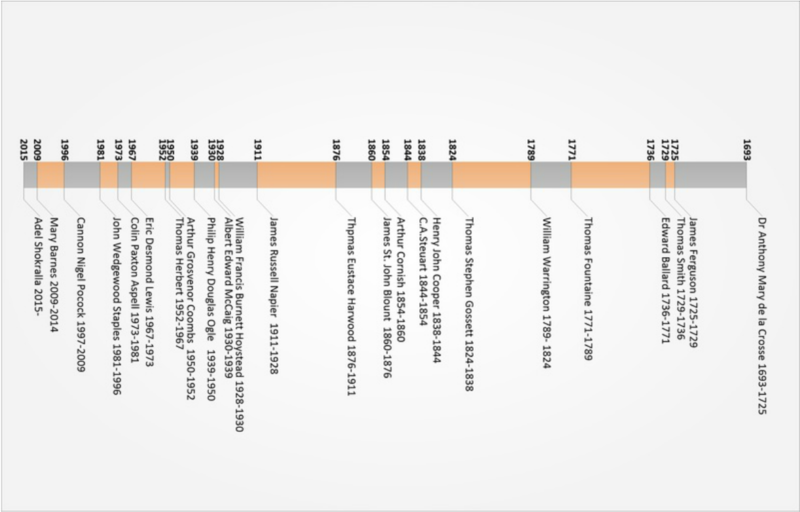 It was decided that the capacity of the building was 80, and there were 80 people there when it was dedicated. The next thing to move into St. Luke’s was the altar table. This had been in the Parish Church – inside the main door, used for hymn books, but it never fitted in well being light oak where all else was dark. 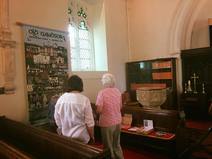 It was a memorial to Mr. William Ellis the village schoolmaster – and also organist and choirmaster who died in 1961. His daughter Miss Ellis was happy to have it used as the altar in St. Luke’s. The altar rails were given by Miss Reddick a long time resident of Old Windsor. She commissioned them and had them specially made in the Great Park workshops from oak from the Park, and they are a memorial to Rev. Harwood who was for many years the much loved vicar of the parish. The lectern was the gift of the Lacey family in memory of their parents, and the Credence table was the gift of the Mothers Union – at one time a flourishing group in the church. St Luke's is fitted with a wide range of audio-visual facilities, and can be used in different layouts and for a wide variety of purposes. The kitchen was completely renovated in 2009. 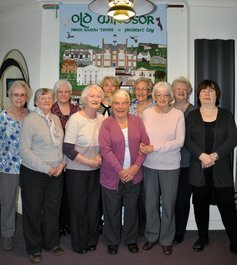 Thank you so much to Old Windsor sewing group who have worked for 3 years on this hand-stitched panel, which will be hung in the Parish Church from Thursday 25th May. They are following in a long tradition in Old Windsor. From 1875 till the early years of the 20th century high quality wall hangings were stitched and woven at “The Tapestries” on Straight Road. Queen Victoria was a patron and some of the work commissioned by her and other members of the royal family are still hanging in Windsor Castle and Hollyrood House. So our local needlework group are keeping alive the Old Windsor tradition, and we hope this beautiful panel, showing features of our own village, will be here for many years, giving pleasure to generations to come.